The Portal series of videogames is well known for its distinctive characters, and their voices. Here’s a video for anyone who may be unfamiliar. The distinctive sound of many voices in the Portal franchise is the result of basic pitch and formant editing, which can be done using Melodyne Editor. A free trial of this software can be found at: http://www.celemony.com/en/trial . Here’s how you can make your own Portal inspired robot voice. 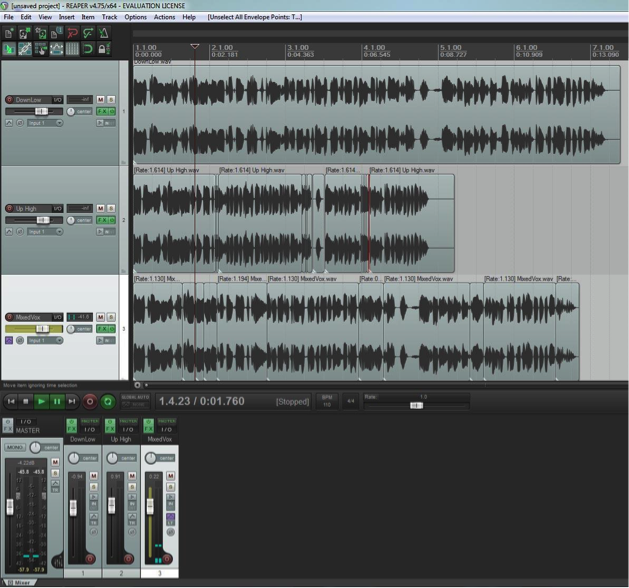 This basic but crucial step can be done in any Digital Audio Workstation – Reaper is used in the photo above. A stereo or mono recording is fine, and rendering the recording as a high-quality WAV file is recommended, although most lower-quality file formats will also work. Ideally, you’ll want to avoid recording in a way which captures the “human” elements of speech; breathing, plosives, glottal fry, and other vocal phenomenon. Many of these sounds can be avoided or minimized by using a pop filter. Here’s an example recording. 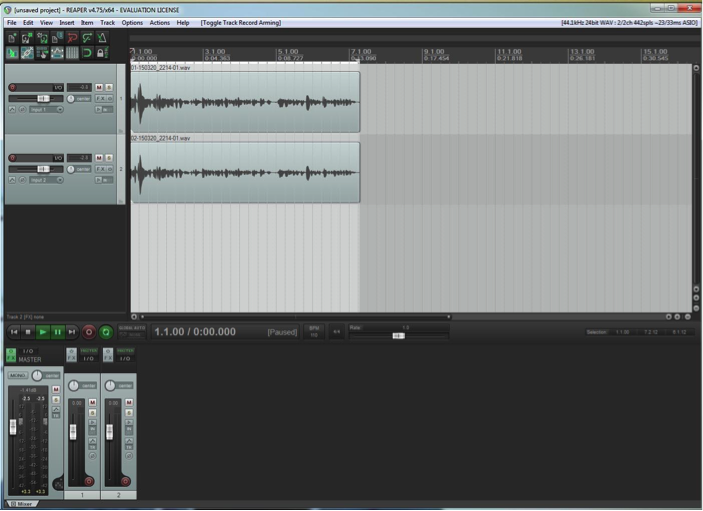 Note; I didn’t use a pop filter, so some plosives and light breath sounds are present. its worth paying attention to how noticeable these sounds are in later examples. While you can use the file menu to import your vocals, you can drag the file directly into the main editor window (the grey window above) directly.If they imported correctly, you should see a window with pitch information pop up, similar to the one above. Troubleshooting Note: If it only shows your vocals as having one pitch (i.e., C4), this may be due to a large amount of ambient noise, or multiple simultaneous pitches if you’re using the Essentials ($99) version of Melodyne editor. Either way, you’ll need to re-record higher quality version of your vocals. By left clicking and dragging, you can select multiple pitches at once – do this. Once you have, right click and select “Edit Pitch”. This will cause the nearest available chromatic pitch for each not to be highlighted in blue. Double clicking a pitch will automatically move all of your selected pitches to this nearest chromatic location, which helps your voice sound less natural. Additionally, moving all your pitches up will make the voice sound more feminine, and moving them down will make the voice sound more masculine. Mixing these approaches creates a warping effect. Right clicking again, selecting the “Pitch Modulation” tool will make any variances in pitch readily apparent. Clicking on a pitch and dragging up or down (making sure all your pitches are already highlighted) will serve to flatten or accentuate these variances – a flat affect is generally effective for creating a robotic voice. Before we move on here’s what our initial vocals sound like after some pitch processing. This optional step can be extremely important if you need your to add additional elements to your voice, such as speaker distortion or corruption errors. Here’s what our earlier voices sound like with some additional effects. The lowered vocals – slightly distorted, slightly bitcrushed, with reverb. 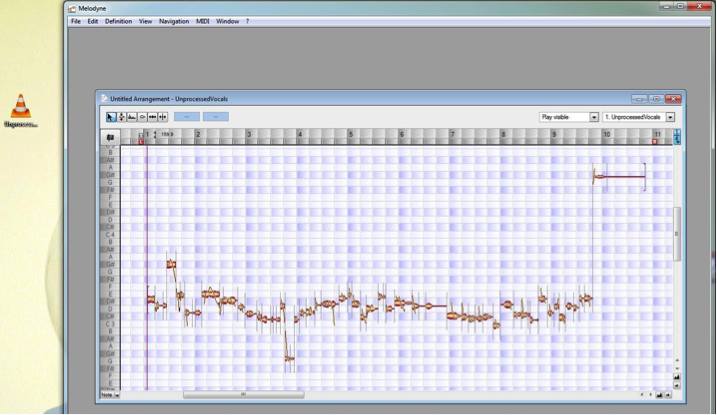 The mixed approach vocals – assorted “corruption” effects, including slowing and reversal. Congratulations, you now know how to make your voice sound like a robot.